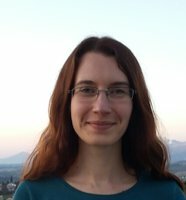 Danica Jablonská is a first-year Ph.D. student at the University of Camerino. She got her MSc in Physical Geography at the Charles University in Prague in 2013 and her MSc in Environmental Resources and Risks at the University of Camerino in 2014. During her MSc program in Camerino, she worked on mass transport deposits within carbonates in Southern Italy. Her Ph.D. research project is addressed to characterization of mass transport deposits, in particular their spatial distribution and micro- and meso-scale structural properties in various depositional environments.